East-West Gateway Council of Governments (EWG) is committed to strengthening local governmental jurisdictions (our membership) through the provision of technical assistance, information dissemination, policy analysis, and education to elected and non-elected officials and staff and the communities they serve. Through local government support, the agency provides tools, assistance, and resources for local officials to make better and more informed decisions and fosters collaboration and cooperation between units of federal, state, and local governments. Each year, EWG presents the Outstanding Local Government Achievement (OLGA) Awards to recognize the extraordinary work of individuals, governments, and other public institutions in the St. Louis region. The 2018 winners to were announced at EWG’s 53rd Annual Luncheon and Awards Ceremony on Nov. 15. You can find a list of the winners in this year’s awards program or check out these video overviews to learn more. 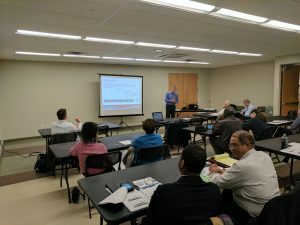 EWG regularly collaborates with the University of Missouri – St. Louis (UMSL) Public Policy Administration (PPA) program, the American Planning Association’s St. Louis chapter and other regional organizations to increase the capacity of the region’s municipalities. The goal of these efforts is to create resources in the St. Louis region and statewide through which local government officials and staff can access quality information, technical assistance and training that helps municipalities address and respond to the needs of their residents. The UMSL Chancellor’s Certificate in Fundamentals of Planning and Zoning, consists of seven, three-hour modules covering planning practices, processes and topics that are crucial for local government success. Course modules are typically held Thursday evenings from 6 to 9 p.m. from October to December. Exact dates and registration information will be announced later this year, check back here or on UMSL’s website for updates. The St. Louis chapter of Emerging Local Government Leaders (ELGL) is an informal group that seeks to support and encourage those working in local government as well as anyone interested in a career in the field. You can subscribe to the chapter’s email newsletter for information on upcoming events and other activities. Published by EWG, Local Government Briefings is a weekly email newsletter that serves as the St. Louis region’s source for local government information, resources, news, and job listings. You can sign up here to receive the newsletter and check out current and recent editions here. To have your job listing included in Briefings, send EWG staff an email at briefings@ewgateway.org that includes: the job title, salary range, closing date, and a link to the full posting. The 20 most recent issues of the newsletter are available at the link above. 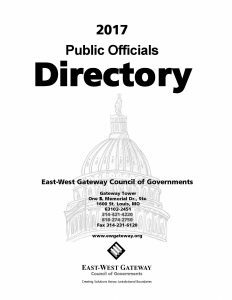 For older editions of Local Government Briefings, please contact Frank Johnson at frank.johnson@ewgateway.org. The Public Officials Directory is a bi-state reference guide which contains contact information for key municipal and county elected officials and primary personnel for the eight counties in the St. Louis region as well as state elected officials, fire/ambulance districts, school districts, and resource organizations. EWG strives to keep the directory as current as possible, so, as information changes, please send any updates, additions, or corrections to POD@ewgateway.org. Contact EWG staff by phone at (314) 421.4220 or (618) 274.2750 or by email at LocalGov@ewgateway.org.